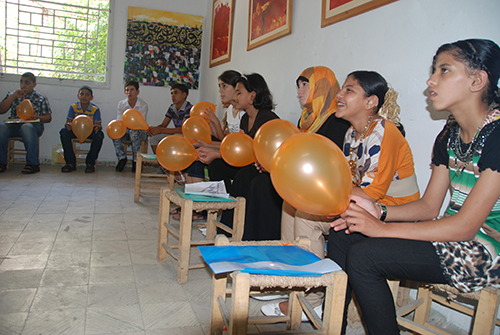 The project ‘Child-led awareness raising on children's rights’ in Gaza was implemented by War Child partner organisation Shababik. This project, in which one hundred children were trained in child rights and photography skills, was evaluated over two annual cycles in 2012 and 2013. Evidence was collected by surveying fifty children per year, eight focus group discussions, progress reports and semi-structured interviews. The evaluation showed that as an outcome of the project, almost all children knew their rights very well and were able to express their opinions freely using the skills they gained through the participatory photography activities. According to the evaluation, the project's added value lay in the child-led awareness raising through the project website, Facebook page, photo exhibitions, a photo spread in the newspaper, a documentary film and a photo book that was developed by Shababik staff in consultation with the children who captured the photos. The project laid the groundwork for the continued support of children to advocate for their rights through creative techniques.